Working in news media relations for Mayo Clinic, I’ve gotten to know Bob Aronson fairly well over the last seven years. He’s been a consultant for us, helping us work with physicians and scientists to make their points more effectively in news media interviews. With decades of experience in journalism, politics and consulting, Bob says the process for news media communication is the reverse of a presentation at a scientific meeting. Whereas medical researchers are accustomed to laying a foundation and then logically progressing to a conclusion, in a media interview it’s important to get to the point first, and then provide the supporting data. Besides Mayo Clinic, another of Bob’s clients has been LifeSource, the organ procurement organization for the Upper Midwest. He also worked with the national organization, UNOS. Bob worked through the news media for years to help tell the transplant story and t0 encourage organ donation. His interest in the topic wasn’t that of a detached consultant, though. Because he had been diagnosed with cardiomyopathy, he knew there was a possibility that he might one day need a transplant. Over the last few years, Bob grew steadily weaker. He moved to Florida last year and became a patient at Mayo Clinic in Jacksonville, where he received a heart transplant on Aug. 22, 2007. I’ve been exploring blogging and social media for a little over a year. 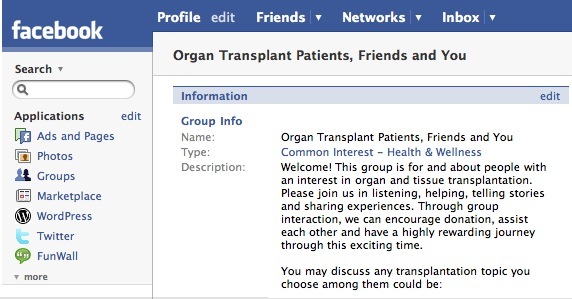 A colleague and I had discussed Facebook‘s ability to connect people, and we thought a support and advocacy group for transplant patients and their family and friends would be a natural. Mayo Clinic has a reunion in Rochester every summer for transplant patients and their supporters. Wouldn’t it be great if this reunion could be more than just one day a year? And if it included patients from many different transplant centers, as well as their friends and family members, that could provide mutual support and encouragement and also increase awareness of the need for organ donors. Given Bob’s passion for the subject and his “old media” background, I suspected he might like the chance to learn how some of these “new media” could support the organ transplant cause. So for the last month or so, Bob has been learning about blogging (using wordpress.com) and Facebook. After years of learning from Bob about news media, I was glad to have a chance to help Bob with his social media education. I hope you’ll join this Facebook group and invite your friends to do likewise, especially if you know someone who has been affected by transplant. Getting people to share their transplant-related stories will hopefully help create more awareness of the need for organs and the difference donation can make. Bob has said he wants to dedicate the rest of his life to promoting organ donation. Social media will play an important role in his efforts. Great post. I’m the campaign Manager of Donate Life Illinois (www.DonateLifeIllinois.org) and with our efforts, we’ve been actively reaching out and connecting with residents via social media outlets. You can check out our online community and Donate Life Illinois facebook group as it pertains to this post. I’d be happy to share any ideas on ongoing efforts with Mayo Clinic and Lifesource on engaging social media in conjunction with our lifesaving efforts.